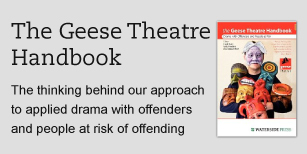 Young people will be able to find out more about arts in the criminal justice system by attending one of our free 8-weekly Introduction to Geese sessions. This includes a history of the company and our methodology, a demonstration of our work and an opportunity for Q&A with one of our Senior Practitioners. Young people will be able to participate in development opportunities through attending an Introduction to Geese session, as above. Young people with be able to research advanced practitioners by applying to interview members of our team (after attending an introduction session) This offer is subject to Practitioner availability.